With a location that cannot be surpassed, this outstanding remodeled craftsman is truly a home that one would love to reside in. 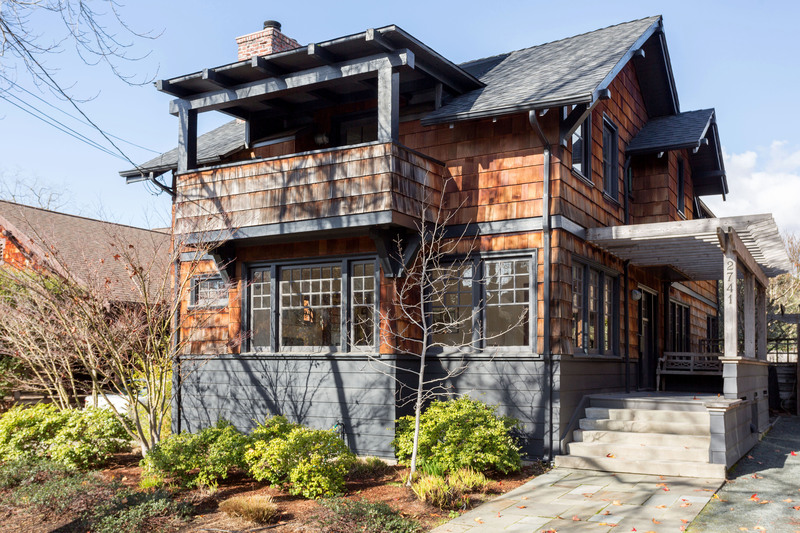 The curb appeal from this brown shingle craftsman is only surpassed by the interior finishes and the spacious rooms. Accessibility to the outdoors is divine: saunter out to the fabulous and private garden from the large remodeled kitchen-family room. The remodel of this home by the current owners was designed by the Bay Area firm Siegel & Strain and the contractor was Creative Spaces. Some Details: This two-story brown shingle Craftsman with two plus bedrooms and 2 and 1/2 baths is approximately 2494 sq. feet (as per public records*). The spacious living room and formal dining room flanked with windows balances the lovely wood wainscoting resulting in bright rooms that are wonderful for entertaining. The eat-in kitchen-family room opens directly to the level garden with a patio, lawn, and raised beds for growing herbs and vegetables. The chef’s kitchen has desirable appliances for anyone who enjoys cooking: six burner Wolfe cook-top, two Thermador ovens, Sub-zero refrigerator and Miele dishwasher. Beautifully landscaped, many days can be spent entertaining and relaxing. The master bedroom overlooks the garden on the upper floor, has a large closet and master bath with radiant heat; adjacent is a room that can serve as a sitting room, office or nursery. The second bedroom is very large and has the additional fireplace. Amenities of this home include two fireplaces, oak floors, skylights that bathe the home in light and the bathrooms have stone counters and floors. Conveniently located on the upper level near the bedrooms are the washer and dryer. Located in a coveted neighborhood and easy access to the Claremont Hotel, Berkeley shops and restaurants, Rockridge and its amenities, including Bart, freeway access and bus transportation to San Francisco, this will make a sublime home for the lucky lessee. For lease: $6250 per month unfurnished***Information and square footage deemed reliable but not guaranteed. ** The owners are offering a one-year lease in this outstanding property with the potential option of renting it furnished at a price to be determined, if this suits one’s needs. Inquire with Helene about this option.